Home / Don’t Judge A Book By Its Cover Reveal! Artists, book designers, editors, marketing folks, publicists, maybe the spouses of half of those folks are involved. But rarely the author. Well, because the truth is: We DO judge books by their covers. After all, the cover is the hook. We get one chance – one picture, one brief set of cover copy – to grab our potential reader or else… they will put in back on the shelf and keep browsing. It’s kind of our Blind Audition moment. A few seconds to show our best and get the reader to turn their chair around and say “I WANT YOU, Book!” I want to read more of YOU. And, since all this happens in a matter of seconds, it’s okay with me – the author – to leave the details in the hands of the folks who’ve done this hundreds of times. They’ve studied the eye of the middle-grade reader who has to be attracted to the cover. And they know the mind of the middle-aged mother who’s going pay for the book. They’ve given thought to the children’s librarian who will decide if to suggest the book to young readers. And they never forget the bookseller who has to decide how many copies to order for their shelves. Put it that way, and I’m glad I’m NOT the one making these decisions. Still, I’ll admit, it’s with a bit of trepidation that I wait for that cover to be revealed. And when it comes and it’s even more lovely and brilliant and magical than I could have ever imagined, it’s worth every bit of trust an author places in those who know what they’re doing. And, so…. 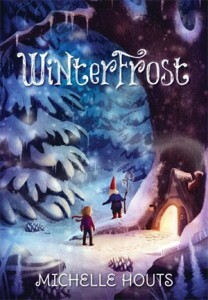 (DRUMROLL) …the cover of Winterfrost (Candlewick Press, September 9, 2014) is revealed. So, now we wait for September. And, even though I’m anxious for Winterfrost to be released, it’s probably a good thing it’s not happening right now. After this incredibly LONG, snowy, cold season, I doubt anyone would pick up a book about WINTER right now. Give me a good beach read. I’m ready! Beautiful. Simply gorgeous! Congrats! And while a good beach sounds just about perfect right now, I’d pick up Winterfrost and read it in a heartbeat on the hottest of sands! Can’t wait to say, “I WANT YOU, Book” to Winterfrost.